Flow Controllers bring the camp to you! The Flow Controllers would also like more suggestions on how they can better bring the camp to you! Leave a comment on the post, and let your friends know about all the awesome lectures going on at the 2011 CCC Camp! Yes, you can still get a Camp ticket! Camp is not sold out! There will be day tickets available for 45 € and evening tickets for 20 €. However, no tents or campers are allowed with day or evening tickets. If you already bought a ticket, don’t forget to print it out! You can login to the presale ticket site to print your tickets. More information is on the camp wiki under “Tickets“. For your orientation and answering the most frequent questions, we created a nice Campguide. 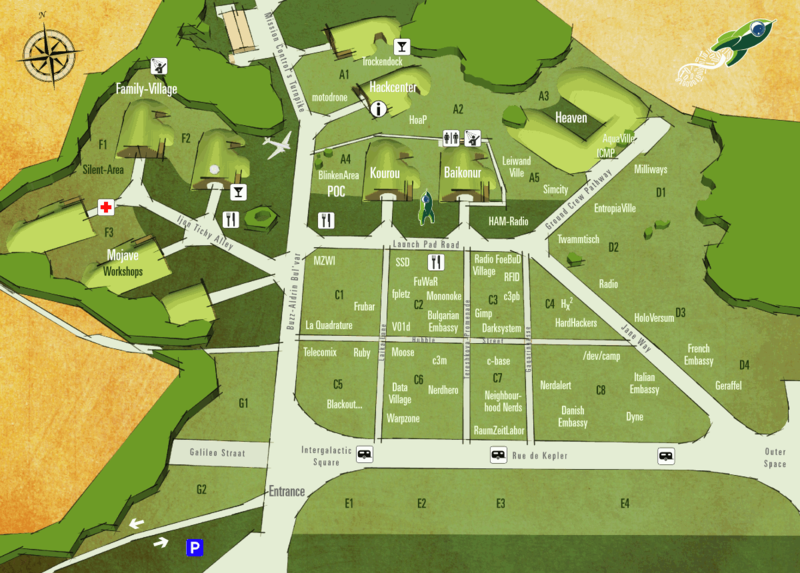 Included in the Campguide is a map with all the facilities and the larger villages. In the center are the two lecture shelters “Kourou” and “Baikonur” and the “Hackcenter” north of it. In front of the Hackcenter shelter is the “motodrone” located, the area where you can fly your quadcopters or similar objects. Behind the Hackcenter next to the small forest you can find the “Trockendock”, an area with music, lights and bars. South and east of the lecture shelters is the main camping area with a lot of villages. In the West you can find the Workshop shelter “Mojave”, some snack bars and the C.E.R.T. (Chaos Emergency Response Team) for first aid. It’s also the area where it is more silent and best suited for families. We chose names for the roads, so that you can easily describe your location. West-to-East roads carry names from space scientist, North-to-South roads are named after famous space travelers and in contradiction the diagonal roads carry names from fictional space travelers. Villages which are not located on the map can choose a free place by their own. If you’ve ordered a Camp ticket in the online sales system and also payed it, you can download your ticket from https://presale.events.ccc.de now. For those of you, who registered an email address we’ll additionally send the PDFs by mail. Please print out your tickets and bring them to the Camp! You need them in order to get your wrist bands. With those tickets you can visit the Camp, all lectures, workshops and the parties in the evening but you have to leave the campsite before sunrise. Children under the age of 12 (born after August 10, 1999) get in for free. If you want to take a trip to the Camp and don’t want to leave your family at home, bring them all. See all ticket options on the Tickets website. Ladies and gentlemen – We proudly present… The Project Flow Control trailer. You can download this fine piece of 3D animation art from ftp://ftp.ccc.de/events/camp2011/trailer/camp2011_trailer.m4v or enjoy watching it right here, right now. Thanks to Marten and e-punc – you rock! The online shop for Camp tickets will close at 2011/07/20, two days from now. If you didn’t buy a ticket yet, you should better go to our online shop now and buy one. Since we don’t know, how many tickets we’ll still have left after online sales, we can’t promise there will be ticket sales at the door. Probably there will be, but if you want to be sure, better buy your tickets now! Almost a week ago we published the Camp Fahrplan (schedule). Follow this link for more information. You’d like to rent a big tent, chairs, and tables for the Camp and did not tell us yet? Then you need to hurry up. We accept orders from you only until June 9th, and that’s tomorrow. For more details see the Rent a Tent page in the wiki.